Here we are, at the end of all things. I have thought about this email so often, I had so many plans of what to say, some epic words of parting, summing up these last eighteen months, but now as I sit here I am completely speechless. The P-Day before changes is always super crazy. Everyone is excited to see who will be their new companion, their new leaders, their new area, excited to hear from families, all of the gossip, the news highlights create a nonstop stream of laughter, shouts and righteous merriment. Its weird to be the outsider looking in, to see all the adventures, growth and experiences that still await these missionaries. 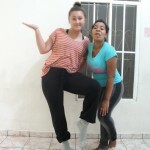 They are going to close our area, rumor has it that they are sending more elders to Tazumal, so we have a lot to do, making sure the area is ready to receive them. 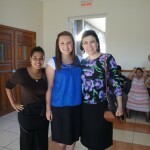 Hermana Reyes is going to Juayua, and not just Juayua, but PROGRESO! 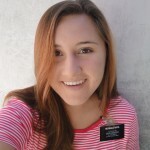 I am so excited for her, she will be in my favorite area, the place that changed my life, watching after my converts and all those wonderful people that I love so much! I am so excited for her!! So our house is a chaotic mess right now. 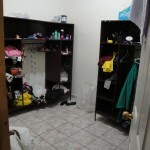 There is laundry drying, and there are half-filled suitcases strewn across the floor. It is so weird to pack things up, to see those few inanimate objects that represent eighteen months of blood, sweat and tears. Yesterday the three of us going home spoke in Sacrament meeting. It was a lot of soggy eyes and warm hugs. The spirit was so strong; it was a beautiful experience. It was weird, starting to say goodbye. It feels more that I am leaving home, rather than going home. To put my feelings into words would be nearly impossible, in English or in Spanish. I feel nervous, I am not quite sure what the Lord has in store, or what I am supposed to do with my life. 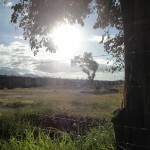 It is going to be weird, having to get back into the rumbo of normal life, and to not be set apart. 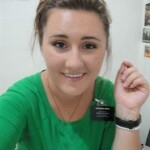 (confession, I have been sleeping with my name tag) I feel hopeful, knowing that the people I have taught and have seen change will continue strong in the church, and that if we are all faithful I will be able to see them again. 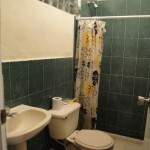 I feel happy to have warm showers and feel carpet again, and to know what it is like to travel in a car again. I feel heartbroken that the dream is coming to an end, that we have made it back to the shire, and the time has come to cross the sea into the west. Thinking on that, my mind is drawn back to my exit interview with President Spjut. As we were ending he made a reference to Peters Last interview with the Lord. Christ asked him one simple question, “Lovest thou me?” and then he invited him to serve. As I have reflected I put myself in that same interview. I had always wanted to finish with an epic scripture talking about fruits or the glory of God, but I think I am just going to finish with my own words. More than anything else, I feel so grateful. I am grateful for every moment, every tear shed, every hard moment, every miracle, every door knocked, all of it. The Lord has made so much more of me than I could ever make of myself. I have loved my mission, because it was mine and the Lords. It was my very own epic adventure, a legend that will live on in my heart forever. It has changed me, refined me, and blessed me more than I believed possible and I will sing praises to my Heavenly Father forever for it. I feel so much love, so much gratitude. Nothing can compare with the joy that I felt when President said “You are returning home with honor.” I know that is true. The spirit has confirmed so much that my Heavenly Father is proud of me and is pleased with my work. And that is what is most important. Thank you for your love, your support, your prayers, all you have done. Really though, I think so much time in the sun has given me short term selective memory…. All week long so many crazy things happen, but when I sit down to reflect and write about it there is a giant blank. Needless to say, it was a good week…. Starting last Monday…. My comp and I went with the other companionship of sisters in our area to Santa Ana, to buy some souvenirs and all that nice stuff. 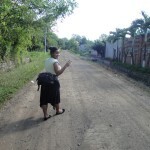 We made it to centro with no problem, wow, and talk about a trip down memory lane. It has been over a year since I walked those crowded, streets or saw those same tomato and underwear vendors. We went, we shopped and started to make our way back when I ran into someone that I thought I would never see again. 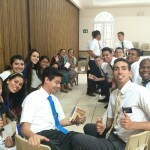 Familia Aparicio (my ward mission leader in Juayua, over two hours away)! When I saw his wife, Sandra, I bawled like a baby and she pulled me into the biggest hug! It was such a beautiful reunion. I love them so much, and it was the biggest tender mercy!! On Tuesday we had our last district meeting (yep, we have begun the “lasts”). 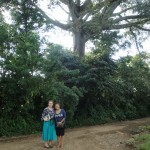 We talked about the Plan of Salvation, but we applied it to our time here as missionaries. BAD IDEA, did very bad things for my psyche. Really there were so many moments this week when I would just randomly burst into tears, that one of my eyes is now just constantly puffy…. que pena. It’s so funny we focus so much on why we come on the mission, but it does not matter because well, we are here now. Then our focus becomes “why are we here now?” But time goes by so quickly and you know why you have stayed, you realize how much you have learned, how much you have changed, and then comes the final question, why you finish. I am still trying to answer that one, but no worries, still have ten more days of hard work. From there we are going to fast forward to Saturday. We did an area attack and did some divisions, to mix things up a bit. 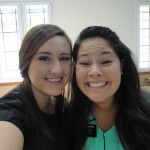 I got to work for the first time with Hermana Bustos (also going home with me). It was so much fun! We found a ton of new people and filled the agenda for this next week. Sunday came. We walked into the chapel, only to find that we had no investigators…. and President was sitting there on the stand. Nice. We finished the first hymn, announcements, and then the Sacrament. As the deacons were finishing up, I looked out the window and in walked a family of three that we have been trying to get to church for over a month. I was so happy, I just started to cry. After Sacrament Meeting President walked over to greet the family and he invited them to keep listening and to follow the promptings of the Spirit. They felt so special! But then President gave us a nice surprise, he decided to stay all three hours, something that I do not think has ever happened. It would have been no big deal, but our Gospel principles teacher did not show up, so yours truly had to give the lesson, having not actually prepared a lesson. But I looked at the topic, “Jesus Christ, our Chosen Leader and Savior.” Wow, what a topic. The spirit was so strong, and I almost cried again, but gratefully Presidents presence kept me on my toes and I was a little too busy being a nervous wreck than to cry. Sister Spjut told me it was a great class so that has to be good. A great First and Last time to teach a Sunday school class to your mission president. Anyways, the time has come, crazy huh? Wow, so we have gotten to 2016, crazy eh? I honestly cannot believe it. I hope that you all had a wonderful holiday and that you are all ready for these next 365 blank pages! We had a really weird week. On Tuesday we had a fabulous district meeting. We talked about working hard, about success and goals for this new year. We watched a leadership training segment by a man named Yokoi Kenji (he is Colombian….. and Japanese) and he shared something very profound about success. He said that in the Japanese culture, true success is recognized over large periods of time, decades if necessary. Honorable success never comes instantly, rather it requires hard work, patience and endurance. 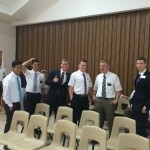 It made me think a lot about my mission and how I am feeling towards the end. Truly, honestly, I had thought that my mission would end very differently. I was hoping a steady stream to the baptismal font or a chapel filled with reactivated members. 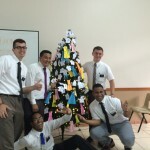 But, missionary work almost never has instant results, the most lasting, fulfilling blessings of our father’s work, will not show fruits until we are brought again to the presence of our Heavenly Father. The harvest has not ended yet; the show goes on. We just have to work our hardest in the time that the Lord gives us, and in the end, all will be okay. We just have to remember the “why” of service, that it is not about what we want to see, or the end result, rather it is because we love the Lord, and we want to show our love to him by serving his children. so, we ate our rice and salad and then ran home! We planned and then popped some popcorn and spent the night listening to the great and spacious fiesta outside and watching “The Best Two Years.” We finished the movie around ten thirty-ish, bed time, but due to the huge fireworks at the neighbor’s house, we laid awake until the wee hours of the morning. New Year’s day as we left the house, the streets were filled with the ghosts of the night before. 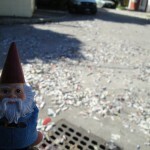 The streets were littered with newspaper shreds, broken bottles, and dinners that had not settled too well…. and not a soul in sight. We had a wonderful lunch eating the chicken we were supposed to have eaten for dinner, and we tried visiting those that were still in town. In an attempt to better serve the members of our ward, we unintentionally have converted into a dog-sitting service. A couple families left town for a few days and left their canine companions at home…. so we stopped by to feed them. 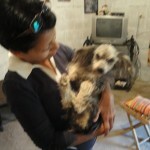 On Friday we stopped to feed Memo, the Cocker Spaniel of our cook, and the pobrecito did not have any food… and everything was closed…. 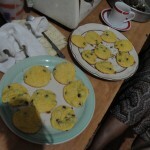 so we ended up giving him rice, and sweet bread, and tortillas. He was still alive when they got home on Saturday so, that is good! On Sunday the ward reorganized four organizations, and we got a new Ward Mission Leader!! Anyways, so crazy week. I am really just very excited to have things go back to normal, without any crazy parties, makes the work run so much smoother. I love you all so much. I am grateful for the unlimited opportunities that this new year has, and I am excited to see what the Lord has in store! Well here we are, another Monday. I am not quite sure where to begin. This week went by so fast, we have had to run to be able to keep up with the time. We have been working so hard this week. We are trying to talk to more people, taking advantage of the opportunity to talk to families out Christmas shopping, and try to share a little of the Christmas spirit with them. It’s funny, because we get a range of responses. Sometimes they are super friendly and we are able to schedule an appointment, other times they are really friendly, but only because they are a little drunk (I think it would be great if the church made a word of wisdom card to hand out), others are shocked when they hear that we celebrate Christmas, and then…. some well, it is not their time. On Wednesday we had a super long zone meeting. President and Sister Spjut came and we learned so much! President was doing interviews, and Hermana Spjut gave a super fun class about directing music, even more fun because we got to lead with candy canes! But, the two hour meeting ended up being five hours and I did not get to meet with President….. Because in a couple weeks I will be having my last interview… AHHHHHHHHHH!!! Anyways, we are going into the week of Christmas. Here in Tazumal there is some serious lacking of the Christmas spirit. 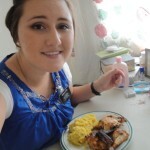 The ward is not doing a program, dinner, nothing. At first I was a little shocked but I had some beautiful insight into that first Christmas. There was no fiesta, no special program, the world wasn’t even organized enough to give our Savior a place to sleep. And this year Christ is not in a stable, or on a cross, or even in a tomb. He is in the hearts of those who truly seek him and make place for him in their hearts. Wise men still seek him. So lets seek the Christ this Christmas, not in the presents, the trees, the lights or all that superficial stuff. Seek him by seeking to be like him, and you will find that the more you make room for Emmanuel, the more he will fill us up and the more his infinite atonement will bless and enrich our lives. Have a Merry Christmas!! I love you all!! Here we are again, another Monday…. It seems like only yesterday I was here telling you about this last week, and yet, time keeps on flying and we are left as spectators. This week was filled with a lot of personal growth. My companion and I worked our butts off, and we almost doubled the number of lessons that we normally have. (Gotta sprint to the finish line!) We have kept branching out to areas that we have not visited as much, in hopes that we could find someone that the Lord has prepared. Though we might not have seen the fruits that we specifically wanted, the Lord definitely put us in the right place at the right time many times. On Saturday night we were leaving the church after baking cookies with the young women when we heard someone trying to get our attention. Sketchy, Right? Well, we turned around, and a young man came up to us. First words out of his mouth, “Do you have a Book of Mormon?” His name is Peter, or Pedro, or The Rock (depending on your version of the bible). 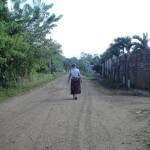 His sister was investigating the church and after she recently passed away he also began to listen to the message of the Gospel. He was so excited to get a Book of Mormon, and was going to begin to read it right away. Oh, he also lives in Costa Rica…… a little outside of the area. On Sunday we also had a beautiful experience. We were making our rounds, trying to bring investigators to church when a young woman walked up to us and asked what time our meetings started. We told her and when we got to the chapel, she was there too!! Her name is Ivon and she was super positive! She stayed the full three hours and had a lot of questions…. But turns out, she is from another zone, and receiving the lessons…. But hey, cool that we could be the Lords hands. It was a beautiful confirmation that though we may not be seeing the fruits we want to see, that we are still successful missionaries and the Lord loves us. 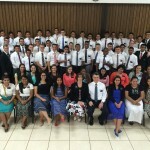 On Friday a young man in our ward came home from serving a mission in Colombia. The ward interrupted our English class and pulled us into his “Welcome Home” party. SOOOOOOO bad for my focus. It was so crazy to see everyone there, taking pictures and all that jazz. Ay no. It does not help that this week I also got my final papers. 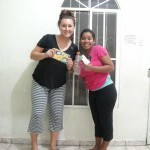 Here in the mission when someone is going to finish the mission, we are given a packet where we review our work in the field, and we set very specific goals for the future in respect to things like school, careers, and yes, even eternal families. It was a nice smack in the face from reality. Oh, the angelitas…. a less active sister has a little girl that loves all things fancy. 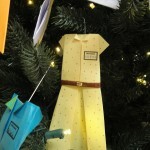 when she saw her little friend in an angel dress going caroling, she had to do it too…. they are so cute!! Anyways, I love you all, Thanks!! The beginning of the end….. It’s the end of the world as we know it… and I feel…. well weird. I cannot believe this marks the start of my last change. How weird…. I have been thinking a lot about what I could share from this last week, nothing super huge happened. 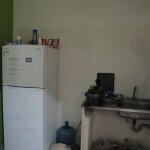 We got up, we studied, and we worked, we came home, planned and prepared to do the same the following day. Being the last week of the change, the time seemed to move like Jello, and we are in the search for “escogidos” which often ends in walking in big circles. But, I love my area and I love my companion so I can’t complain. We have been super anxious, wondering if either of us will have changes, but all fears were hushed when the zone leaders called last night and told us that we don’t have changes. Woo Hoo!!! 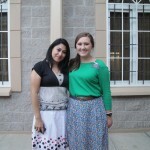 I am so glad that I get to finish with Hermana Reyes. She is so amazing! Ironically this last Thursday I caught the same cold that she had last week. We stayed in Thursday morning, but despite the fever and sore throat, we went out to work, the greatest cure!! I am feeling a lot better now, so no worries. 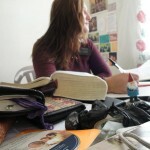 We are still working on English, and I think that Hermana Reyes is teaching me more than I am teaching her. I am having the hardest time remembering basic grammar and I am just a Spanglish wreck. My comps favorite phrase is “I’m sorry for you”…. 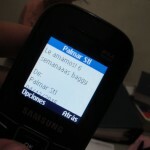 he he he. The other two companionships in the area had baptisms this week and it was beautiful to see these wonderful people enter into the font. On Friday, English class was cancelled due to the baptism of a young man, but we were surprised when our investigator from the Peace Corps showed up! Granted, she came to learn English but she stayed to see the baptism instead. She loved it! When the service was over I walked her over to the baptismal font and asked her how she felt. She said that she felt the spirit, and she asked me what she would have to do to be able to be baptized! We put some goals with her, and hopefully before the end of the year, she can also take this step! On Sunday, we did not have investigators in church again, but we had a bunch of wonderful things happen. 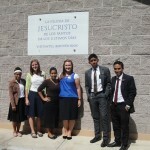 I walked into church, and right in front of us was Elder Lopez from the Area Seventy and his wife. It is the same Family that I met in my training, and saw again in Juayua. I wondered if they would remember me. As soon as she saw me, Sister Lopez literally ran over and through her arms around me! 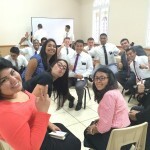 “How funny,” she said, “we see you at the beginning, in the middle and now at the end of your mission.” Thanks for the reminder Sister Lopez…. I also received a phone call from the Bishop in my very first area, and guess what?! A family that I baptized is preparing to be sealed this month! Words cannot even begin to describe my joy!! We are also full into the Christmas season…. Since the stake center is kinda far, our Relief Society president invited us over to see the Christmas Devotional in her house. Listening to the choir and the messages brought tears to my eyes…. wow. I love Christmas!! Another week here in the field. Where do I begin? Really time is such a fickle thing, there are moments when it’s so slow, and then before you know it, its Monday again, and there are only seven more Mondays and tomorrow begins December. WHAT?! 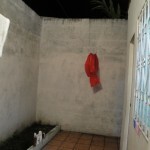 Pues si….. This week we worked and worked and worked some more. I think we were on the devil’s radar but the Lord was always there to pour out a tender mercy. 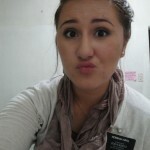 Hermana Reyes got a nasty cold Wednesday night. On Thursday she was even worse and all attempts to try to do divisions so I could go and work backfired so we got to stay in a couple hours and rest. I was really stressed out, thinking about all the things that we needed to do, about a fickle thing called time, and worried about my companion, and well, basically I was just a little anxious. So, I pulled out our disk of Mormon messages and I happened across one that follows children from their birth to when they enter the mission field. I don’t know what it’s called but it’s accompanied by the hymns “I hope they call me on a mission” and “To bring the world his truth.” I remembered what day it was. Thursday, the 26th of November. A year since I had finished my training, a year since I had said goodbye to Hna Judd, I thought about all that I had learned in a year, all that has happened. I also remembered that it was Thanksgiving. The spirit came and I was filled with such a strong sense of gratitude towards the mission, towards all the people I have met, towards my family that have helped prepare and support me, and more than anything to my Heavenly Father for all he has given me. Sure, I had a weepy moment, but it was a great little reminder that everything is in the Lord’s hands, we are just here for the ride. He longs to bless us, and he is constantly doing so. On Friday, my comp was feeling much better and so we got back to work, full force! Dennis, the little boy we have been teaching was supposed to be baptized but everything was falling through and working against us. We couldn’t find pants, the cake was too small, the members were getting frustrated, lots of drama. But then before we knew it, it was Saturday. We got up, studied and left to work. I was still stressed out, and we weren’t quite sure what to expect. 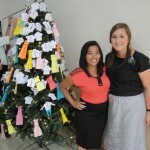 We went to the chapel to help support a Relief Society Activity. A less active sister that we have been visiting came, along with her nonmember mother that we have been teaching. #miracles! The activity was beautiful, and encouraged the sisters to be more loving and to look for the good in everyone. The spirit was definitely there. And then a visiting sister stood up to share some thoughts and my heart stopped. 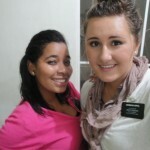 I had seen her before, almost exactly a year ago, on my las P-day with Hermana Judd. It was one of her converts. I think that she recognized me to too because she gave me a weird look, but she did not remember who I was…. After the activity I walked up to her, and I introduced myself, and started to explain who I was. I had scarcely mentioned the name of Hermana Judd when she threw her arms around me and said “Te conozco, te conozco!” (I know you, I know you!) We both sobbed into each other’s shoulders and she asked how I have been. I asked a little of her story too. 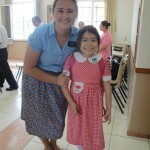 She was sealed in the temple earlier this year and continues faithful in the church. It was a beautiful reunion. In true El Salvadoran style, Dennis was an hour late to his baptism. People were so caught up in cakes, and piñatas, and all the other logistical stuff, it was a little frustrating that no one was too focused on the ordinance. But then everything was calmed down and we were all there in the baptistry. Primary children all gave the baptismal talks and then Dennis was baptized by his Dad. Our musical number fell through, and so I sang “I know that my Redeemer Lives.” The spirit was so strong, and all the stress and tension that had lingered around was dispersed. It was a beautiful tender mercy. So some closing thoughts. We had a fantastic talk given yesterday about pride, using a talk by Ezra Taft Benson, and the brother said something fantastic. He said, “Pride is asking yourself ‘what do I do with my life?’ instead of asking ‘what does God want me to do with my life?” Wow, it was a nice reminder that I need to accept the Lords will and trust in his timing. I love you all!! Hoorah for Israel! Hmmmmmmmmmmmmmmmm………………… Where do I begin? 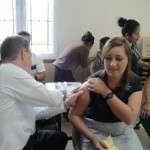 I sure do love being a missionary. There were so many crazy things this week but when I sit down to write, i cannot remember anything at all…… Let’s see. I taught my first lesson in English. Yep, that’s right, in ENGLISH! The Elders gave us a reference of a young woman. 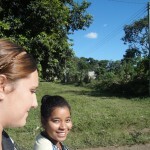 When we walked up to the house a bunch of young girls ran out shouting our arrival. We met Yesenia. 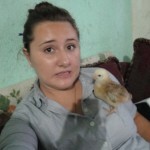 She is part of something like the Peace Corps and she wants to learn English. She already speaks very, very well, but she needs someone to practice with. 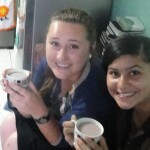 At first, I felt a little bad, thinking that she just was interested in the chance to talk to a gringa, but we started to talk about the church and she was very interested as well. 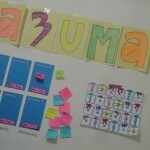 I felt so clumsy trying to teach in English, but the spirit was there. She surprised us both and asked what was required so that she can be baptized!!! What?! It was a miracle, but we will see what happens! She came to our English class on Friday too…. This Friday we had our Thanksgiving Multi-zone conference. It was amazing but really weird at the same time because, it was my last multi-zone conference….. AAAAAAAHHHHHH! But moving on, it was wonderful! 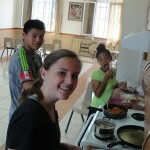 We talked about some changes that we are making in the mission, new directives, and new goals. We watched the new Christmas initiative that the Church has put out #hanacidounsalvador and wow, it’s beautiful! You should all watch it! I felt the spirit so strongly! 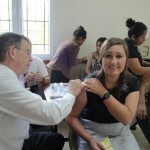 We also got our flu shots and celebrated an early thanksgiving! 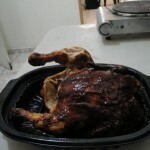 We even had a turkey lunch with cranberry sauce! 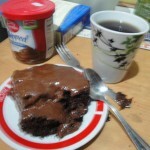 So very delicious! So on Monday we went to visit the sister that had told us she did not want to be baptized, and she had changed her mind. 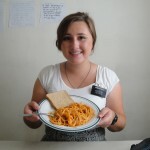 We visited her every day, praying with her, reading the Book of Mormon, and helping her to feel the spirit. We had everything ready for her baptism on Sunday. We left early on Saturday to go and buy the refreshments, we confirmed the talks and musical numbers and then we stopped by her house in the afternoon to give her some final moral support. But from the moment we walked into the house something was off, and we sat down to talk with her. She did not want to get baptized….. She had just changed her mind and that was that. It was really disappointing, but I am glad that she was honest with us and that she shared her anxieties with us beforehand. 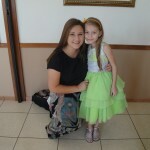 She said that she still wants to come to church and keep learning, but that she was not ready to be baptized right now. So, we will keep working with her and we will see what the Lord has in store. On a slightly happier note, we have been working with the son of our ward secretary who just turned nine and hasn’t been baptized yet. He is getting baptized on Saturday!! 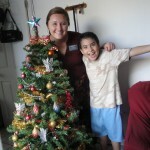 But his Dad is super busy with work and his calling so it has been really hard to find him and teach him. Yesterday we had to get permission to go to the Stake Center in Chalchuapa so that we could teach him while his dad was in a meeting. We talked about the first vision and the Restoration of the Gospel. It was such a beautiful lesson and it felt so good to be able to explain the gospel in such simple terms. The spirit was so strong and so beautiful! 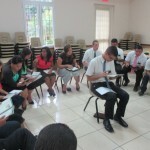 Yesterday was third Sunday, and the missionaries were asked to give the talks. I was so nervous, in the past there has been a lot of tension between missionaries and members, and it’s all about a good presentation. I wrote my talk about three times and nothing felt right. Finally we were sitting there in church and I still had no idea what to do. I had written some final thoughts but nothing seemed right. For the Sacramental hymn we sang “I stand all amazed” and the spirit hit me so strong, saying “just bear your testimony about the atonement”. I stood up to speak and for the first time in my life, I totally gave an impromptu talk. I don’t really remember all that I said, but I remembered the story of Alma, how his own experience with the atonement inspired him to share the gospel. How many of us have received a change of heart, have been born of God, and if we have felt to sing the song of redeeming love, can we feel so now? And what are we doing so that someone else can sing it too? I also spoke about the sacrament. How many of us partake of bread and water? And how many of us partake of innocent blood and broken flesh? 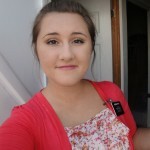 I was afraid of being to direct, of offending someone, but then the spirit came to my mind and the words of Mormon inspired me. I told them that it is not my job to ask for references, or to ask them to leave and visit with us “I am a disciple of Jesus Christ, the Son of God. I have been called of him to declare his word among his people, that they might have everlasting life.” I am here to preach repentance, to invite others to come to Christ, not to give a pretty sermon about missionary work. I’m not here to talk about the work, but to do the work, and well, that’s what I am trying to do. En fin, I think that it turned out okay. My comp said that the spirit was really strong, that’s good. I sure love you all and I hope that you are never afraid to open your mouth and share your testimonies. Thank you for all your love and support. Um where do I start? Another week, working hard, trying to do the Fathers week. It was a rough week I can’t lie. The adversary was trying to get to us from every angle, but we made it through!! Really I think that is the going away lesson this week, that it despite all the ugly, all the craziness every day we made it back home, and we woke up each morning with a new day, a new start. Those moments when we felt we could not go one more step, the Lord gave us the strength to take two more, and little by little, we kept moving forward. We lost our baptismal date on Tuesday, and my companion and I were just distraught. 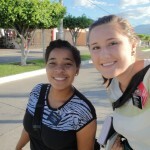 But the next day our District Leader called us and went with us to meet with her. We sat down sang a hymn, “Let the Holy Spirit Guide,” and we prayed. My companion started the lesson, and our DL interrupted her, and said that he had come to do the baptismal interview (not planned?!) The sister looked at him and said “But I don’t want to be baptized? !” But, she agreed to meet with him. About half an hour later, we met back up with them. The sister took my hand, looked into my eyes and said, I am sorry that I said I would not be baptized, but now I do…. I am ready now to be baptized.” what a miracle! On Sunday our baptismal date did not come to church, so we will have to put a new goal with her, but she still has a firm desire to be baptized, we just have to keep the hosts of hell at bay one more week. It was so crushing when she did not come, though the Lord was there, as always with a bunch of tender mercies. We had another investigator surprise us, and we sang some of my favorite hymns. After church, the elders had a baptism of a young boy and the spirit was so strong. To see this young man’s excitement inspired me to keep going, and that though we don’t see all the fruits at once, they will come in time…. but in the Lords time, not mine. Wow, when I read this I felt the spirit so strongly, and it was as if the angel was talking to me. In this past general conference one of the brethren said something really powerful. I think I have shared it before but it is worth repeating. 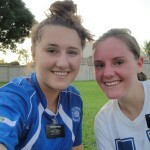 “The Lord does not call you because of what you have done, he calls you despite what you have done.” But Latter-Day Saints keep on trying day, and Latter-Day Missionaries never ever give up. So, we gotta tighten the boot-straps and keep working, one week more, one day more, and one hour more…. The time is ticking, we are going into the final minutes, and there are no more “time-outs.” We have to run, run, run, until the buzzer sounds and the Great Jehovah says “the work is done.” So, that’s what I’m gonna do. I love you all. Thank you for your love, your support, and your prayers. They mean so much more than you could ever know. I’m not quite sure what to share, we just keep working and trying our best to be exactly obedient and give an extra effort. The fruits weren’t immediate, but the Lord always pours out his tender mercies. We had two inactive families come to church with us and some new investigators. We also were able to hit the standard of excellence in lessons with members! Yay!!! 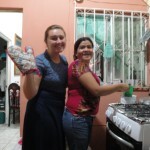 On Tuesday I was able to go work in El Refugio with Hermana Timoteo. She is such a wonderful sister, and I learned a ton! We found a couple new investigators and had some spiritually charged lessons. It was great to be able to leave my area for a day and take a little breather helping out the other sisters! 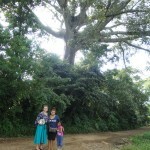 We went to visit Josefina and Susana and we talked about the first vision. 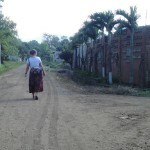 The next day Susana told us she had prayed to renew her testimony of the first vision and the book of Mormon and she had a dream where she saw Joseph Smith receive the plates. Cool story! The Best part of the week was Friday. The daughter of our first counselor was baptized and confirmed. It was so beautiful, and the spirit was so strong. We had some investigators come and they all had confirmations that they should be baptized! Sorry, short this week, we are just working hard and seeking souls. Love you all!